Today, DJ Sbu co-hosted the show with actress Kamo Mothibeli as part of Youth Month. 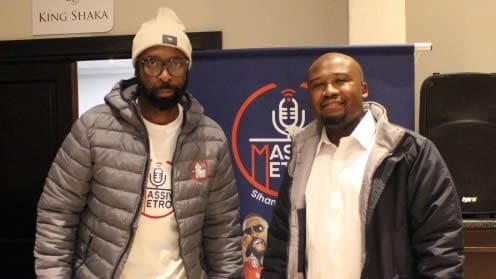 Every week during the month of June, DJ Sbu will host the show with a young person doing amazing things in their industry as part of celebrating the youth. Another day, another bright and early start with the DJ Sbu Breakfast from the Ekurhuleni Youth Summit at Birchwood Hotel. We had Advocate Modise Koetle, who is the divisional head of the youth directorate in the office of the executive mayor, as our guest this morning. He’s responsible for co-ordinating and overseeing the youth programme with the city’s mayor and implementing programmes within the department. Given that it was day 2 of the conference, he began by giving us his feelings on the first day of the conference. “Yesterday went well, we believe we reached our target. Young people came through and spoke to us about their challenges and how we can assist them with their growth and development,” he said. He also told us of how he made it into the position that he is in and also how having financial problems of his own inspired him to do the kind of the work that he does. “I struggled to pay my own fees when I was studying and I went to the municipality to see if I can get the bursary within the youth division. I didn’t get it but I was very interested in this division and now I’m part of people approving bursaries for the same division that didn’t give me a bursary,” he says with a laugh. In line with the mayor’s priorities for the city, the division also has a strong focus on education for the youth. “The fundamental issue is education and [is] what we have as a main pillar. Young people want to have businesses and be entrepreneurs, but we need to get educated first”, he said. He also highlighted the importance of forums such as the Ekurhuleni Economic Youth Summit by saying that most programmes that are eventually implemented by the city stem from forums such as these. “It is here that we hear from them [the youth] what it is that they want and need from us. These expos are very beneficial; they serve as public participation platforms”. As part of keeping up with technology and keeping in touch with the youth, they have a couple of projects that they are working on in the near future, namely the Ekurhuleni Youth Portal and the Ekurhuleni Youth Brigade. “We also have a new project that we are working on called the Youth brigades at ward level, where one youth brigade will be mobilising for projects and letting young people know about opportunities. They will also be working with ward sector heads to inform young people about opportunities available and how they can be empowered,” he added. Where does he see Ekurhuleni in 2025? “In 2025, Ekurhuleni will have a huge youth precinct which will be a youth retail empowerment space where all young people can come in. I also see a university of applied sciences at an advanced stage that will be as big as MIT is in Boston. Huge Wifi rollout as part our smart city digitisation but I can’t say yet when it will be complete but areas such as Germiston and Kempton Park have started receiving Wifi but the plan is to have Wifi around the whole city.